As an enthusiast of Magical Girls, I tend to watch many magical girl anime that looks interesting. Some of them, I watched till the end due to their awesomeness (ex: Cardcaptor Sakura, Magic Knight Rayearth, Shugo Chara, Nanoha). For many others, I completely dropped them due to their lackluster content (ex: Mermaid Melody, Powerpuff Girls Z). So being the curious person that I am, I stumbled upon the insanely popular Pretty Cure series and decided to give it a shot, after finding out that Pretty Cure has already surpassed Sailor Moon in means of length (Sailor Moon had 5 seasons; Pretty Cure now has 7 and still ongoing). After quite a while, I have finally finished the first season of Pretty Cure, titled "Futari wa Pretty Cure!". So how does it stack up? Let's take a look. ***Please note that since most magical girl shows are aimed for younger audiences, I tend to judge them differently than how I would usually judge anime aimed for older audiences. Therefore, I will be more lenient and let more things slide when reviewing these kinds of shows. I will also try to keep the review as spoiler-free as possible. The first Pretty Cure follows the story of Nagisa Misumi and Honoka Yukishiro. Nagisa is the athletic kind of girl, always energetic, courageous, and often acts before she thinks. Honoka is a bookworm type, very intelligent and good at academics, but is soft-spoken and timid. One day, the two of them encounter these two fairy creatures, named Mepple and Mipple, which could transform into some cellphone/card reader/Digivice-sort of gadget and give the two girls the power to transform into the Legendary Warriors of Light, Pretty Cure. Together, Nagisa and Honoka must work together to collect the Prism Stones, seven jewels containing the Power of Creation, in order to restore the Garden of Light to its former glory. Standing in their way, however, is the Dark King and his evil henchmen, out to capture the Prism Stones themselves so they could use its powers to fulfill their evil plans. From there, the story becomes a wild race to see which side can collect the Prism Stones first, and along the way, both sides engage in various skirmishes. I must admit, the story is probably one of the weaker points of this show. Sure enough, the show itself is entertaining all in all due to the awesome fight scenes and the charming characters (which I'll go over later), but the main plot itself is weak since it is something that's been done in many other magical girl shows before. Another problem plaguing the story is its monster-of-the-week format. Pretty much every episode follows the same procedure: The girls enjoy their social life, the bad guy shows up and tries to ruin their day, the bad guy summons a monster, the girls transform into Pretty Cure and defeat the monster, the bad guy flees, and the girls enjoy the rest of the day. While the monster-of-the-week format is pretty much expected when watching a magical girl show, I've seen many other magical girl anime pull off this routine much better than how Pretty Cure did it. Sadly, this could get very tiresome for some people, causing them to drop the show early on. My final gripe with the story are the fillers. Yes, I know that pretty much EVERY magical girl show has fillers, but what bothers me is that fillers make up 60% of this entire show, and only 40% are storyline-related episodes. I mean, there are instances in the show where they could show one storyline episode, and then follow it up with seven straight filler episodes before another story episode shows up. The pacing becomes very slow this way, and this slow pacing could also put off some people. In my opinion, Pretty Cure didn't even need to have 49 episodes. I think if they cut all the fillers, the main storyline could probably be accomplished in only 26 episodes or even less. But of course, the show was doing so well, and Toei Animation wants to make big cash, so they extended the show longer than it should be. However, if one sticks long enough and puts up with the fillers and the cliches, then they will be treated to a very enjoyable storyline. In fact, the show had a pretty sad ending, even if it was judged by regular standards. But I won't into any more detail with the ending; if you want to find out, go watch the show. Yes, yes. I know. Whenever the word "magical girl" pops up, overly cheerful candy pop/techno music comes into mind. That is not the case with Pretty Cure, however. I'd say that Toei Animation definitely invested a lot of money into Pretty Cure's soundtrack. Instead of the generic pop/techno music common in magical girl anime, Pretty Cure actually has a fully-orchestrated soundtrack. From the opening theme song to the background music, you can definitely hear the trumpets, trombones, flutes, violins, xylophones, and the many other instruments used to compose this show's soundtrack. Not to mention, this show has a number of catchy tunes, such as the music playing when the Pretty Cure use their "Rainbow Storm" attack or the J-Pop song "Shining Star" played in a couple of serious scenarios. Although not the best, Pretty Cure's soundtrack still deserves special praise. Kudos to Toei for that! THIS is the show's strongest point. If there is one thing this show excels at, it's the characters. Not only do we have plenty of charming characters, but many of them also have pretty good backstories. For example, since Nagisa and Honoka are polar opposites, it is very amusing to see how they work together as a team. There would be instances where their different ideas and behavior would cause them to fight, but it's always adorable to see them make up and become friends again. This show also places a heavy emphasis on teamwork; for example, Nagisa and Honoka cannot transform into Pretty Cure if they are separated. This is a flaw that the bad guys will exploit a number of times throughout the show, and it is very entertaining to watch how Nagisa and Honoka will work around their flaw. Some minor characters also have very interesting backstories, some even having complex pasts that would normally NOT be shown in a little girls' show. For example, Honoka's grandma was a survivor of the atomic bombings back in WWII, and they even devoted one episode showing how she, as a young girl, managed to walk out alive from a demolished Hiroshima/Nagasaki, and how she reacted when she saw that the whole city was wiped out and flattened to the ground. It was a very chilling and touching moment, and is definitely something you would never expect from shows like Cardcaptor Sakura or Tokyo Mew Mew. Kudos to Pretty Cure for having the guts to pull off something like that. And of course, what magical girl anime would be complete without romance? Pretty Cure is no exception. Throughout the show, Nagisa would often make attempts to confess her love to this handsome boy, named Fujiwara (or Fuji-P, as Nagisa calls him). Of course, most of her attempts fail, and hilarity ensues. There is even a point where one of Nagisa's best friends tell her that she too is in love with Fuji-P, and even asks Nagisa herself to help her confess to Fuji-P (being completely unaware that Nagisa is also in love with him). Now, Nagisa must choose whether to not let her friend down and help her confess to Fuji-P, or turn her down to have Fuji-P all for herself. It's a tough choice, and it is very entertaining to watch how Nagisa deals with this issue, making the romantic sessions of this show worth watching. Of course, even this show's character developments have a downside. For instance, only the good guys' backgrounds were explored, and the bad guys' developments were completely tossed aside. In fact, due to lack of development, the bad guys' motives were never even explained AT ALL. No explanation was given whatsoever as to where they came from and why they're doing the evil acts that they usually do. It just boiled down to "The bad guys are evil because they're evil" concept, and I didn't like it. In my anime, I always prefer it when the show gives a legitimate reason why the villains are being evil. Unfortunately, Pretty Cure fails to do this, much to my disappointment. However, since this is a little girls' show, I'll just let this one go. Sadly, this is Pretty Cure's weakest point. Now, I'm not saying the animation is atrocious. In fact, it has its equal share of good and bad points. Let us go over the good points first. First off, one of the very first things one would notice about this show is that the fight scenes are intense. If you were to take the steroid-infused warriors of Dragon Ball Z, turn them into middle school girls, and give them magical girl powers, then Pretty Cure is what you'd get. For example, in your typical magical girl shows like Shugo Chara or Tokyo Mew Mew, the fight scenes would mostly be composed of the girls dodging enemy spells, throwing in some of their own attacks here and there, talking about the power of love or friendship or whatnot to try and dissuade the enemy, and then finish off the distracted enemy with some overly-colorful and flashy burst of light, which they call their special "attack" (if you even count that as an actual attack), but most of the time, those "attacks" just end up looking like cheesy light shows, and the fight scene overall feels weak and lacking impact (I'm looking at you, Tokyo Mew Mew). However, Pretty Cure does none of those crap. When the battle starts, Pretty Cure gets right to the point and shows its audience what a fight's true nature is: violence. It does not try to sugarcoat its fights, it gets to the point and holds nothing back. Fight scenes in Pretty Cure are composed of the combatants throwing a relentless barrage of punches and kicks, individuals sent flying and slamming into buildings, individuals getting grabbed by the ankle and smashed into the asphalt road, combatants destroying nearby structures and making them collapse into their enemies, combatants shooting explosive energy bolts at one another, individuals grabbing metal pipes and using them as swords, super villains using their magic to make all the cars in an underground parking lot spontaneously explode, and so on. Yeah, you get the picture. Of course, the Pretty Cure also have their own special finishing attacks. Their first one, "Pretty Cure Marble Screw" (yes, it's a weird name), consists of Nagisa and Honoka shooting a spiraling lightning beam at their target, which not only electrocutes the target, but also drills a hole through them. Their second special attack, "Pretty Cure Rainbow Storm", in which the two girls fire a gigantic, rainbow-colored, DBZ-style laser beam that smashes through obstacles, makes the earth tremble with its might, and vaporizes the target if it hits. All these, in my opinion, is what makes Pretty Cure's fight scenes one of the best out of all the magical girl shows I've seen. Okay, okay. I'm pretty sure that you guys might be thinking, "If you loved the fight scenes so much, then why did you only give the animation a 3/5?" Well, the one main problem that is plaguing the animation quality is no other than.... STOCK FOOTAGE! Yes, as awesome as the fights are, this show undeniably ABUSES stock footage! Their re-using of the stock footage is relentless, and if you watch the show, you'll be able to quickly notice this. There is not a single episode of this show where stock footage is not used. While I'm more lenient on this show, it still doesn't change the fact that stock footage abuse is a big no-no on my books. I can normally put up with some stock footage here and there, but a complete abuse just wears out my eyes. Another less noticeable problem is that there are instances where the animation would become choppy. While not as prevalent as the stock footage, there have been quite a number of scenes in this show (most of them during fight scenes) where the animation became as choppy as heck. This isn't really that big of a problem, but I really wish Toei did a better quality control and kept the animation at a consistent frame rate. All in all, the animation could've been pure awesome, but the stock footage abuse and the occasional choppy frame rate is what dragged the animation's score down to 3/5. Despite its numerous flaws, Futari wa Pretty Cure remains to be a very solid and exceptional magical girl anime. The storyline might be cliched, but is definitely enjoyable, the characters are very charming and adorable (especially Honoka), the soundtrack is impressive, and the fight scenes are intense and action-packed. The fillers and the stock footage might drag down the story, but the show still leaves you with a good impression once you finish it. This is something I'd highly recommend to fans of magical girls, and maybe to those who are interested in the genre. Thanks to Futari wa Pretty Cure, I have now officially become a fan of the Pretty Cure series, and have started watching other Pretty Cure seasons, such as the recent Heartcatch Precure (Which I am now finding much better than this one. Cure Sunshine FTW! ), and also the various Pretty Cure movies. I have even bought a number of Pretty Cure merchandise, such as a Cure Dream 1/8 scale PVC figurine and a Yes! Precure 5 Go Go soundtrack. Now, I definitely wish that the other Pretty Cure seasons would make it into Crunchyroll. Only time would tell. This anime is a combination, of Sailor Moon and Dragonball Z. This anime focus around 2 characters named, Nagisa and Honoka. Two girl's who are completely different from each other. The 2 girl's team up with 2 fairies, in order to protect their world from The Evil Dark King and is followers. This anime is very funny, good lessons, and some pretty good fights. This anime is a twist on the magical girl genre. Nagisa and Honoka are two girls who transform into Cure Black and Cure White. Highly recommended and would recommend to others. It's a new favorite in my mind. 2. To NOT have the same scenes of animation used two to three times in every single episode. 3. If you want an anime that doesn't heavily narrate every single thing that just happened. I only found out about this series due to netflix airing Gilttler Force witch in Japan is called Smile Pretty cure and is a later season of this series. This has clearly became my favorite magical girl series with just amazing battles and fun villains. the two girls who are like day & night team up to stop the forces of evil from destroying the universe. I love seeing there two personality's clash in this show & how it makes them better friends. Cure Black has easily become one of my favorite Female Superheroes. 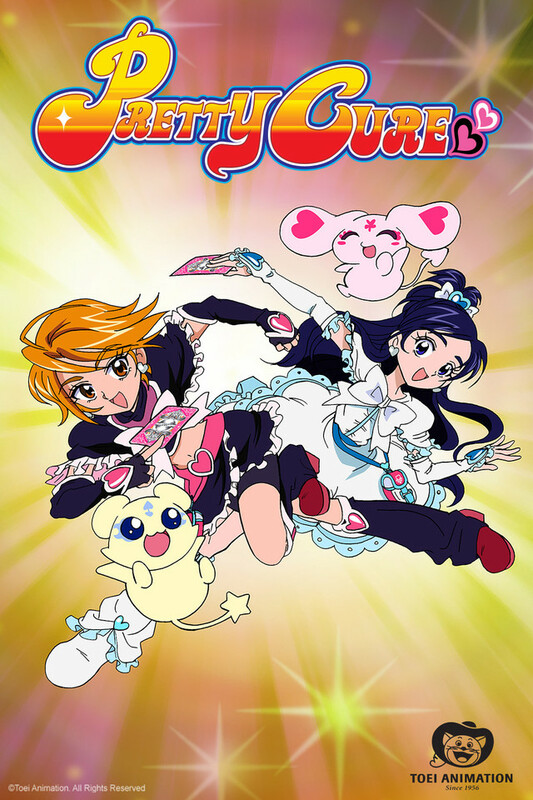 while this may not live up to sailor moon, I like it much better than Sailor Moon, Card captors, & Mew Mew Power, I only wish crunchy-roll would get the other seasons of pretty cure. Since pretty cure is like power rangers or digimon where each season or other season depending on the series of pretty cure the main heroes are changed. pretty cure is an awesome show for girls all ages.it is awesome because their are two ordinary girls who discover that they were the chosen warriors to protect a land that is in danger because of the dark king. it is a splendid show that includes magic and girls with a few bad guys to make it even more fun to watch it is the perfect combination.i love pretty cure!!!!!!!!!!!!!!!!!!!!!!!!!!!!!!!!!!!!!!!!!!!!!!!!!!!!!!!!!!!!!!!!!!!!!!! I can't choose a favorite in Yes! Pretty Cure 5, but if I did it would be either Cure Lemonade or Cure Aqua. I can relate to them both! I'll miss them but excited ta move on!!! Last year i found pretty cure and loved it!! !Then i finished the first season for some reason not all were subbed not on here but some where else and I also skipped season 2 and went ta the 3 season with new girls lol but i wish crunchyroll would sub or dub the other season 2!! !